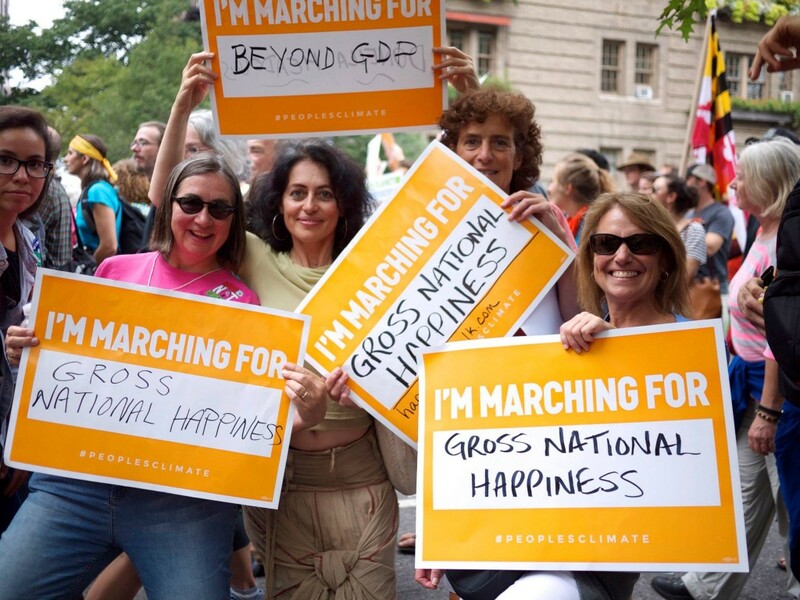 Three weeks ago I joined more than three hundred thousand people at the People’s Climate March in NYC. As we anxiously waited to start marching, a wave of silence spread from person to person up 60 blocks from the front of the crowd. Our thoughts went out to people from the Andes, arctic regions, and island nations who already have lost their means of living due to melting glaciers and rising seas. We thought also of victims of Irene, Sandy, and Katrina and all of the weather extremes that are making Earth less and less hospitable. Then we shouted as loudly and exuberantly as we could and walked into the largest climate march in history. Many were marching for the creatures that have become icons of an uncertain and endangered life on Earth: bees, bears, maple trees, coral reefs. Veterans for Peace were marching to stop oil wars. Concerned mothers and youth groups marched for a climate-safe future. Of all the reasons for marching, there was one that was underscoring all others: the need for a new economic system that won’t drive our civilization to collapse in rushing to extract the last drop of oil in the ground. As economic motives have taken over in decisions where common sense, reason, ethics, and love would guide us much better, new solutions and approaches are essential. Nothing less is left to any reasonable person than to become a civic innovator—to think, dare to imagine, and experiment with alternatives. Next week, Marjorie will lead two panel discussions in Vermont. The focus of each is on ownership designs that can empower New Economy alternatives in business, finance, land, energy, and more. From making land accessible to young farmers and running community-owned renewables to transitioning to worker-owned companies and building networks of local investors, Vermont is already on its way to an ownership revolution. We hope that these events and the rest of New Economy Week will help this revolution gather speed. As Dana Meadows herself often noted, “Political will is more readily summoned for a way forward to a desirable future.” New Economy Week helps paint a picture of this future by demonstrating the true extent of what is possible—a prosperous, equitable, value-driven economy that promotes a world we want to live in. This forum featuring Marjorie Kelly will explore Vermont’s leadership in implementing the “ownership revolution” and include a panel discussion with local entrepreneurs and thought leaders in business, land, energy, and finance. Register here. This business-focused event will feature presentations by Marjorie Kelly, Gardener’s Supply founder and CEO Will Raap, and Deputy Commissioner of Securities Michael Pieciak. Discussion will include business transitions to worker ownership, new approaches to business capitalization, and maintaining control over mission and values in business. Register here. For a complete schedule of all events, see our Vermont’s New Economy Week page.